DRYNESS & COMFORT - Special silver fibre gives optimum moisture control. Reduce growth of bacteria and fungus. Keeps your feet dry and comfortable (Dry feet = Less blisters). Also anti-odour & anti-static. GUARANTEED - We are most confident that you'll love our compression socks. But if for whatever reason it just doesn't work as you'd hoped, we've got you covered with a hassle free LIFETIME GUARANTEE! Just send them back our way, and we'll gladly refund your money, no problem! GIVE IT A TRY! CLICK "ADD TO CART" BUTTON NOW AND FEEL THE DIFFERENCE!! 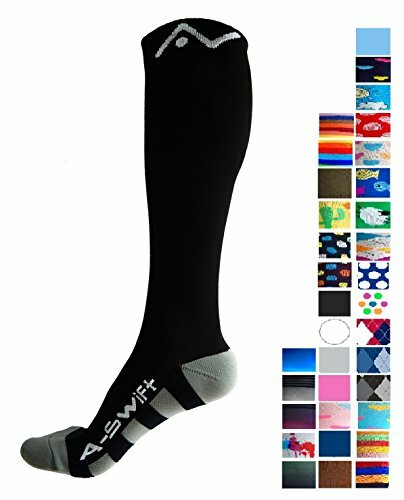 GRADUATED COMPRESSION (20 - 30 mmHg) & PROMOTES FASTER MUSCLE RECOVERY - Better Blood Circulation as strongest compression happens at the ankle, and gradually decreases moving up the leg. Better oxygen circulation helps reduce lactic acid build up and aids muscle recovery. BEST VALUE PACKAGE: You get a HIGH QUALITY pair of compression socks AND a FREE BONUS E-BOOK (entitled "Let's Play Tennis") containing 10 Chapters of useful information on the game of Tennis. Suits tennis players looking to improve their techniques and those keen on picking up the game. If you have any questions about this product by A-Swift, contact us by completing and submitting the form below. If you are looking for a specif part number, please include it with your message.